Roasted red pepper hummus bites are an easy appetizer and delicious too. Chop the cucumbers, roasted bell pepper strips, and parsley into small diced pieces. Fill each phyllo cup about two-thirds full of the hummus. Place a few pieces of cucumber, red pepper and parsley on the top of the hummus. Sprinkle with a little bit of feta cheese. 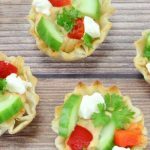 The longer the phyllo cups sit the softer they become so don’t make too far in advance from serving. If you are following Weight Watchers this recipe is 2 points for each fillo cup.